“Anytime At All” was recorded at a time when The Beatles had practically no time to do do anything apart from fulfill contractual agreements. It was all very bonkers in June 1964. The mayhem of Beatlemania was in full flow in every corner of the globe. Only a few weeks earlier Brian Epstein realized that this Beatles thing was probably the future and sold his interest the NEMS music shops to concentrate full time on managing the band. Around this time during a photo shoot Ringo collapsed with a temperature of 103 and was taken to hospital suffering from tonsillitis and pharyngitis. There was no way he could play. 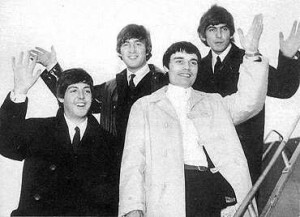 Jimmy Nicol was immediately drafted in and forced into Ringo’s suit as there was not time to make him a new one. At first, George didn’t want Ringo to be replaced and refused to go on the tour without him, but Brian Epstein and George Martin convinced him. Paul McCartney thought he was okay for the tour, but that the fans would definitely know the difference if he recorded with them. And Brian thought it was a good choice because he thought he "looked like a Beatle and not an outcast". During the tour, every time one of the Beatles asked Jimmy how he was getting on all he ever replied was "It’s Getting Better". Paul made a note of this and used it as a title of a song on on Sgt. Pepper. Time was also short during recording sessions. John had a half written song that would have normally been saved for their next album but the “Hard Days Night” soundtrack needed a couple more tunes so “Anytime At All” was slapped together as a rush job. “a rewrite of It Won’t Be Long C to A minor, C to A minor—with me shouting." Paul came up with the chords for middle eight but time pressure meant that it never got finished hence the instrumental in the middle. A Hard Day’s Night is the first Beatles album to be written entirely by John and Paul. Normally they would contribute a roughly equal number of songs to each album, but A Hard Day’s Night is the one Beatles album on which Lennon’s dominance as songwriter is by far the greater, being the primary writer of 9 of the 13 tracks on the album. Ironically John writes from the perspective of someone who has time to be there for a partner “Anytime At All” when in-fact he barely had time to tie his own shoes let alone care for anyone, even himself. Maybe it was some kind of fantasy that he had to wait another 15 years to fulfill with Yoko and Sean in the Dakota. The Ukulele version features anglo-cuban a. This is our second Cuban version of a Beatles song in two weeks. Why did we do this – well expect some very interesting news to come out of Havana in the next week or so – remember – you read it here first. Lead vocalist David Sandoval slips between English and Spanish wooing his lover with promises of fidelity and reliability. I think so but you can never be sure with musicians can you? Although their name means "from exile" in Spanish, four-piece band DelExilio have created a musical home for themselves within their unique hybrid of American rock and lithe Cuban soul. The band is the brainchild of singer-guitarist David Sandoval, a New Yorker of Cuban descent, whose vigorous acoustic guitar playing is both the band’s main engine and the bridge joining its disparate styles. Atop that foundation, expect spidery lines on the Cuban tres (guitar) winding through bongos and bass patterns, claves giving way to backbeats, and a general funk “a lo Cubano” that ultimately does justice to all of its influences. Featuring Cuban tres guitar by Delexiliio’s Alex Fernandez Fox, whose solo album "Uno" features more of this fusion between the Cuban tres guitar and American rock.